I was fishing Line Creek in Kansas City, North. This is a small creek about 15-20 feet wide that is only about 6 inches deep with the occasional pool of about 2 feet. I was using my Tenkara rod (3.3 m), about 13 feet of #3.5 level Line, 5’ of 5X tippet and a size 18 olive wet fly. I had caught about 30-40 bluegill and creek chubs, which are my primary quarry around where I live. I felt a light tap and set the hook. I immediately knew this wasn’t a chub. Using my photo box, I snapped the picture. I’m probably the only person that fishes this creek, which is a shame. I also saw a gar, around 18-20” long cruising a very productive pool. It was a great day fishing in a beautiful area! Now there ya go. Nice picture. Don’t bemoan having the creek all to yourself. It’s a good thing that the "fill-the-freezer" crowd aren’t interested in micros and mini-size bluegills and bass. They’re missing out while you’re having great sport. For even more fun consider investing in a seiryu rod or maybe a light keiryu rated for 6X. Chris will be glad to help. Welcome to the little fish club! You have inspired me to get out and use my photo box. 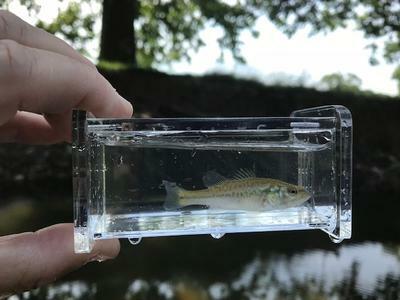 Alan who posts on the blog has inspired me to get out and fish for micro or small fish. Last year I went out a couple of times with the goal to catch the smallest fish possible. I found that challenge to be as fun as trying to catch monsters. Nice report. I scouted Line, Shoal and Brush creeks several years ago, but haven't made it back North of the river to actually fish them. Obviously, I'm missing out. Next time you see that gar cast to it. Keep your fly on the surface and pull it by it's nose. They'll strike nearly every time. Have you noticed any shiners in the pools? A small fly and a quick touch will put one in your photo tank. I'm always looking for more species. I’ve been surprised by what I’ve caught. I just found Tenkara Bum a couple months ago, but have been "micro fishing" for about 30 years. I call it "Chubbin", after the Creek Chubs. My spinning gear is a Nordic ESP 5’ that will cast from 1/80 to 1/32 oz anything. Bead headed nymphs and heavy terrestrials work fine! I use that rod for EVERYTHING and have caught lots of shiners, but also a few 18-22 inch trout and a bass that tipped about 5 pounds. The Tenkara set up is getting a workout and I did catch a shiner a couple days ago, but it flipped off before I could box and snap him.